JoyBuy offers the SanDisk Ultra 400GB U1 A1 MicroSDXC for $77.99. 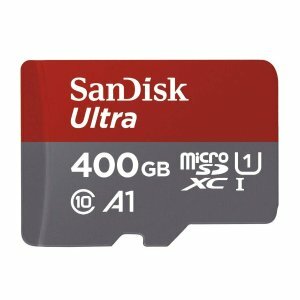 B&H SanDisk Ultra 400GB U1 A1 MicroSDXC for $79.99. Features: SanDisk Ultra microSDXC and microSDHC cards are fast for better pictures, app performance, and Full HD video. Ideal for Android smartphones and tablets, these A1-rated cards load apps faster for a better smartphone experience.